ambient temperature that exacerbates milk spoilage before it reaches the ultimate market and consumers. Alganesh Tola. 2002. Traditional milk and milk products handling practice and raw milk in Eastern Wollega. M .Sc. Thesis presented to the School of Graduate Studies of Alemaya University, Ethiopia. Basaga, H., and Dik, T. 1994. Effect of the lactoperoxidase system on the activity of starter cultures for yoghurt production. Milchwissenschaft, 49: 144–146. Eyassu Seifu, Buys, E. M. and Donkin, E. F. 2003. Effect of the lactoperoxidase system on the activity of mesophilic cheese starter cultures in goat milk. International Dairy Journal 13: 953–959. Eyassu Seifu, Buys, E. M., Donkin, E. F., and Petzer, I. M. 2004. Antibacterial activity of the lactoperoxidase system against foodborne pathogens in Saanen and South African Indigenous goat milk. Food Control, 15: 447–452. Eyassu Seifu, Buys E. M., and Donkin E. F. 2005. Significance of the lactoperoxidase system in the dairy industry and its potential applications: A review. Trends Food Science Technolog,y ,16: 137-154. Eyassu Seifu. 2007. Handling, preservation and utilization of camel milk and camel milk products in Shinile and Jijiga Zones, eastern Ethiopia. Livestock Research for Rural Development, 19: 1-9. FAO (Food and Agriculture Organization of the United Nations). 2002. World Agriculture: towards 2015/2030. FAO Perspective. Earth Scans Publication, London. FAO/WHO (Food and Agriculture Organization of the United Nations, and World Health Organization). 2000. Guidelines for the preservation of raw milk by use of the lactoperoxidase system. CAC/GI 13-1991. Vol. 12. Rome, Italy. Farah, Z, Mollet, M., Younan, M. and Dahir, R. 2007. Camel dairy in Somalia: Limiting factors and development potential. Livestock Science, 110: 187-191. Firew Kassa, Zelalem Yilma, Getnet Assefa, Tadesse Bekele, Yohannes Gojam, Rahel Nebiyu and Binyam Kassa. 2013. Evaluation of Lactoperoxidase system as raw milk preservative at different storage temperature conditions in the central highlands of Ethiopia. Livestock Research for Rural Development, 25 (4): 2013. Getachew Felleke. 2003. A Review of the Small Scale Dairy Sector - Ethiopia. FAO Prevention of Food Losses Programme: Milk and Dairy Products, Post-harvest Losses and Food Safety in Sub Saharan Africa and the Near East. Helen Nigussie. 2007. Traditional handling practices, preservation methods and evaluation of the lactoperoxidase system and container smoking on the microbial quality of cows’ and goats’ milk produced in Kombolchaworeda, eastern Ethiopia. MSc Thesis. Haramaya University, Ethiopia. IDF (International Dairy Federation). 1988. Code of practice for preservation of raw milk by the lactoperoxidase system. Bulletin of International Dairy Federation, 234 p.
IDF (International Dairy Federation). 1991. Milk and milk products enumeration of microorganisms, colony count at 300C. International IDF Standard 100B: 1991: International Dairy Federation, Brussels, Belgium. Knoess, K. H., Makjdun, A. J., Rafig, M. and Hafeez, M. 1986. Milk production potential of the dromedary with special reference to the province of Punjab. World Animal Review, 57: 11-21. Korhonen, H. 1980. A new method for preserving raw milk-The lactoperoxidase antibacterial system. World Animal Review, 35: 23–29. Kula Jilo and Dechasa Tegegne. 2016. Chemical Composition and Medicinal Values of Camel Milk. International Journal of Research Studies in Biosciences 4 (4): 13-25. Kula Jilo. 2016. Medicinal Values of Camel Milk. International Journal of Veterinary Science and Research, 2(1): 018-025. Kumar, R. and Bhatia, K. L. 1999. Standardization of method for lactoperoxidase assay in milk. Lait, 79: 269–274. Lambert, J. C. 2001. Global lactoperoxidase programme: The lactoperoxidase system of milk preservation. Bulletin of the International Dairy Federation, 365: 19–20. MoARD (Ministry of Agriculture and Rural Development). 2014. Ethiopian Livestock Master Plan (LMP): Roadmaps for growth and transformation (2015-2020). Developed by the Livestock Master Plan team. Livestock Resources Development Sector. Addis Ababa, Ethiopia. Mulugojjam Adugnaa, Eyassu Seifu, Ameha Kebeded and Reiner Doluschitz. 2013. Quality and Safety of Camel Milk along the Value Chain in Eastern Ethiopia. International Journal of Food Studies, 2: 150-157. Njage, K. M. P. and Wangoh, J. 2008. Impact of the Lactoperoxidase System on Activity of Selected Lactic Starter Cultures in Camel Milk. Food 14: 70-74. Njage, K. M. P. and Wangoh, J. 2010. Effect of lactoperoxidase-thiocyanate-hydrogen peroxide system and storage temperature on keeping quality of raw camel milk. African Journal of Food, Agriculture, Nutrition and Development, 10:10. O’Connor, C. B. 1995. Rural Dairy technology. Training manual No 1. ILRI (International Livestock Research Institute), Addis Ababa, Ethiopia. Pruitt, K. M. and Njage, D. N. 1991. The lactoperoxidase system of bovine and human milk. In: Robinson, D.S. and Eskin, N.A.M. (Eds. ), Oxidative enzymes in foods (pp. 133–174). London: Elsevier Applied Science. Richardson, G. H. 1985. Standard Methods for the Examination of Dairy Products, 15th Edn. American Public Health Association, Washington, D.C. 168-196. Sarkar, S. and Misra, A. K. 1992. Utilization of milk preserved by LP system for manufacture of cultured milk products. Indian Dairyman, 44: 536–540. SAS (Statistical Analysis System). 2000. Users Guide: Statics Version 8, SAS institute. Inc, Cary, NC. Stephens, S., Harkness, R. A. and Cockle, S. M. 1979. Lactoperoxidase activity in guinea-pig milk and saliva: correlation in milk of lactoperoxidase with bactericidal activity against Escherichia coli. British Journal of Experimental Pathology, 60: 252 – 258. Taye Tolemariam, 1998. Qualities of cow milk and the effect of lactoperoxidase system on preservation of milk at Arsi, Ethiopia. M .Sc. Thesis presented to the School of Graduate Studies of Haramaya University, Ethiopia. 63 pp. UNDP/MOA (United Nation Development Program/Ministry of Agriculture). 1993. Food production, food security and nutrition: In: Getachew Feleke, 2003. Assessment of the Ethiopian dairy sub sector. FAO action program for the preservation of food losses. FAO/MOA, Addis Ababa. Workneh Abebe, 1997. Assessment of nutritive value of and consumer preferences for some varieties of cheese made from goat milk. M .SC. Thesis presented to the School of Graduate Studies of Alemaya University of Agriculture, Ethiopia. 108p. Yonas Hailu, Eyassu Seifu and Zelalem Yilma. 2014. Physicochemical properties and consumer acceptability of soft unripened cheese made from camel milk using crude extract of ginger (Zingiber officinale) as coagulant. 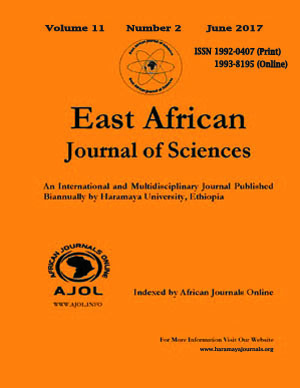 African Journal of Food Science, 8(2): 87-91.